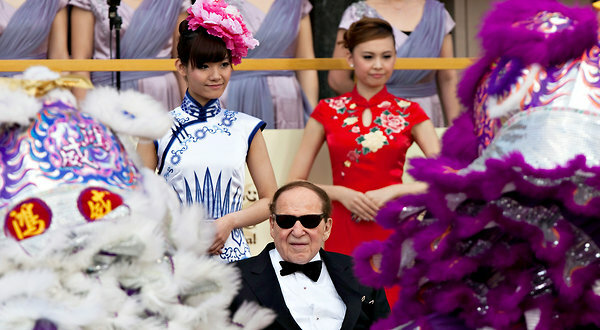 Mr. Romney has had no role in Bain’s operations since 1999 and had no say over the investment in China. But the fortunes of Bain and Mr. Romney are still closely tied. The financial disclosure forms Mr. Romney filed last August show that a blind trust in the name of his wife, Ann Romney, held a relatively small stake of between $100,000 and $250,000 in the Bain Capital Asia fund that purchased Uniview. In a statement, R. Bradford Malt, who manages the Romneys’ trusts, noted that he had put trust assets into the fund before it bought Uniview. He said that the Romneys had no role in guiding their investments. He also said he had no control over the Asian fund’s choice of investments. One of the key questions about Romney’s Bain record has always been over what span of time he’ll be treated as accountable for the company’s operations. Democrats would like that window to extend to the present, since Romney continues to draw substantial income from the company. Romney has emphasized that he hasn’t been tied to Bain’s day to day business in quite some time. The debate will play out in the general election, and the Times story is a reminder of why the stakes for Romney’s campaign will be considerable. Professor Peter Morici discusses where the United States can turn to improve its economy and credit rating. In a clip from his interview with WSJ’s Simon Constable, Dr. Nouriel Roubini insists that it was the policies of George W. Bush that caused the current U.S. economic crisis. The debt crises in Europe and the U.S. collided violently this week, raising questions about whether political leaders are capable of stemming the trans-Atlantic panic. The President reiterated his strong support for the preservation of the unique religious, cultural, and linguistic traditions of Tibet and the Tibetan people throughout the world. 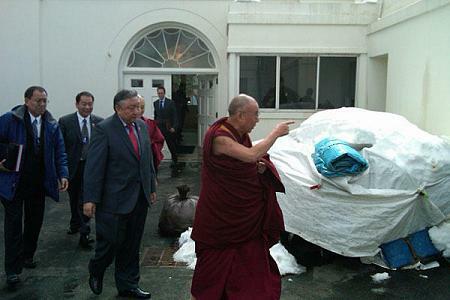 He underscored the importance of the protection of human rights of Tibetans in China. The President commended the Dalai Lama’s commitment to nonviolence and dialogue with China and his pursuit of the “Middle Way” approach. Reiterating the U.S. policy that Tibet is a part of the People’s Republic of China and the United States does not support independence for Tibet, the President stressed that he encourages direct dialogue to resolve long-standing differences and that a dialogue that produces results would be positive for China and Tibetans. The President stressed the importance he attaches to building a U.S.-China cooperative partnership. The Dalai Lama stated that he is not seeking independence for Tibet and hopes that dialogue between his representatives and the Chinese government can soon resume. The strange thing about all this is that the Dalai Lama met with John Boehner, and that an unscheduled meeting, in the White House, with the president, took place in the Map Room. There was no press allowed, and only one photograph, with no video coverage. The Dalai Lama exited through the back door. WASHINGTON/BEIJING (Reuters) – China accused the United States on Saturday of “grossly” interfering in its internal affairs and damaging relations after President Barack Obama met exiled Tibetan spiritual leader the Dalai Lama at the White House. Obama met the Nobel Prize laureate for some 45 minutes, praising him for embracing non-violence while reiterating that the United States did not support independence for Tibet. 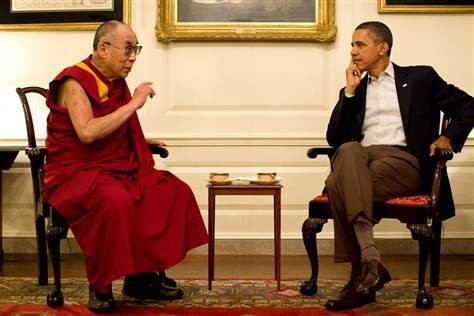 China, which accuses the Dalai Lama of being a separatist who supports the use of violence to set up an independent Tibet, said Obama’s meeting had had a “baneful” impact. “Such an act has grossly interfered in China’s internal affairs, hurt the feelings of Chinese people and damaged the Sino-American relations,” Xinhua quoted Chinese Foreign Ministry spokesman Ma Zhaoxu as saying in a written statement. “We demand the U.S. side to seriously consider China’s stance, immediately adopt measures to wipe out the baneful impact, stop interfering in China’s internal affairs and cease to connive and support anti-China separatist forces that seek ‘Tibet independence’,” Ma said in the statement. The Dalai Lama denies China’s accusations, saying he wants a peaceful transition to autonomy for the remote Himalayan region, which China has ruled with an iron fist since 1950, when Chinese troops marched in.